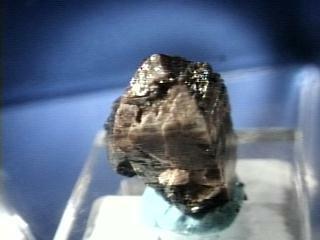 Zircon's reputation has suffered of late due to the introduction of a diamond simulant. So for the record, zircon (zirconium silicate, ZrSiO4) is NOT the same material as the artificial gem material Cubic Zirconia (zirconium oxide, ZrO2). However with that in mind, zircon has been used as a diamond simulant both for innocent and nefarious reasons. Zircon resembles diamond in luster and fire and colorless zircons have been mistaken for diamonds by experienced jewelers. Zircon can make a very attractive and affordable gemstone. It is found in browns and greens but can be heat treated to beautiful blue and golden colors. Colorless material is produced in this way as well. Zircon is the December Birthstone. As a mineral specimen, zircon is uncommon in most rock shops because attractive specimens are rare. However, fine specimens of well shaped zircons are available and are in demand. The typical simple crystal of zircon is a tetragonal prism terminated with four sided pyramids at each end. The prism may be lacking and the crystal can look octahedral. More complex crystals have faces of a less steeply inclined prism that taper the terminations. Also a secondary prism may truncate the primary prism by cutting off its edges and producing an octagonal cross-section through the crystal. There is even an eight sided pyramid (actually a ditetragonal dipyramid) that may modify the four sided pyramids. As you can see, zircon crystals can go from a very simple crystal to a rather complexly faceted form. Color is brown, red, yellow, green, blue, black, and colorless. Crystal Habits: dipyramidal and prismatic as discussed above. Cleavage indistinct in two directions, prismatic. Associated Minerals albite, biotite, garnets, xenotime and monazite. Notable Occurances Seiland, Norway; Pakistan; Russia; Bancroft and Sudbury, Ontario, Canada and New Jersey and Colorado, USA. Best Field Indicators are crystal habit, hardness, luster and density.